The Reynolds family cleaning up North Run Creek. Photo courtesy Neale Foster. Did you know that North Run Creek snakes along the property line of Reynolds’ Parham Road Campus? All along the path you’ll find informational signs that were originally put up by DCR (Department of Conservation and Recreation) and approximately 2 miles of trails that follow the creek line and zig zag through the surrounding woods and fields. Not only is this peaceful, mostly shade-covered trail available to Reynolds students, faculty and staff, but it’s also available to the public every day! On Friday, August 12th, at 9AM in 95 degree weather, a group of volunteers from Reynolds, comprised of staff, faculty, family members, and including one adventurous rising freshman, participated in the annual creek clean-up with the patient help of buildings and grounds employees. We are proud to say that three library staff people, Suzanne Sherry, KC Frankenburger and Neale Foster, assisted with this clean-up. Afterward, cooling down in the air conditioning. Photo courtesy Neale Foster. Volunteers spent roughly two and a half hours picking up paper, styrofoam, plastic, old tires, bottles, cans, candy wrappers, and any other litter they found along the path. And they didn’t complain about the weather once! (Okay, maybe once.) But no matter the weather, it’s always important to remember to that keep our environment beautiful we have to do our part. If you get the chance, please check out the trail to experience the beauty of nature right here in our own Reynolds back-yard! And remember: Re-use, reduce, recycle! With the Summer semester coming to a close, and fall semester right around the corner, you may have noticed a new face in the library at the Parham Road Campus. At the end of June, the library was pleased to welcome David “Will” Weaver as our electronic/web services librarian. Will served three and a half years as Systems Librarian with Henrico County Public Library. In his tenure with HCPL, he achieved several notable accomplishments, which included overseeing a successful migration of the ILS to a hosted/SaaS solution; streamlining/automating several daily workflow tasks; enhancing the aesthetic and functionality of the online catalog; overseeing the system administration of the opening of two new libraries; and laying the groundwork for migrating to a modern, updated online discovery layer. Prior to working with HCPL, Will served as a teacher and librarian with Henrico County Public Schools, including serving four years as librarian and girl’s assistant basketball coach at Highland Springs High School. Outside of the library profession, Will is an avid music and film enthusiast and in 2012 co-founded a local non-profit film collective Good Day RVA, which films local bands in unique areas around Richmond and across the state. From filming and editing, to managing the website, Will is highly involved in the group’s creative output. Other hobbies include trail running, basketball, cider-making, and fishing. Please join us in welcoming Will to the Reynolds family! Posted on August 3, 2016 Author KCCategories General, PeopleTags JSRCC staff, Library, new library staffLeave a comment on Welcome, Will Weaver! With summer semester coming up, the library staff is hard at work making sure that life at the library continues on as usual so that students can expect the same great service they get during the Spring and the Fall semesters. But secretly… ? We’re all quietly daydreaming about taking big slice out of our summer reading lists. I asked the staff what sure-to-be-amazing titles are at the very top of their “to-read” lists during our downtime this summer, and this is what they told me! Fifteen years ago, a murder-suicide in room 712 rocked the grand old Bellweather Hotel and the young bridesmaid who witnessed it, Minnie Graves. Now hundreds of high school musicians, including quiet bassoonist Rabbit Hatmaker and his brassy diva twin, Alice, have gathered in its cavernous, crumbling halls for the annual Statewide festival; Minnie has returned to face her demons; and a colossal snowstorm is threatening to trap them all in the hotel. Then Alice’s roommate goes missing—from room 712. The search for her entwines an eccentric cast of characters: conductors and caretakers, failures and stars, teenagers on the verge and adults trapped in memories. For everyone has come to the Bellweather with a secret, and everyone is haunted. In a series of essays, written as a letter to his son, Coates confronts the notion of race in America and how it has shaped American history, many times at the cost of black bodies and lives. Thoughtfully exploring personal and historical events, from his time at Howard University to the Civil War, the author poignantly asks and attempts to answer difficult questions that plague modern society. In this short memoir, the Atlantic writer explains that the tragic examples of Michael Brown, Trayvon Martin, and those killed in South Carolina are the results of a systematically constructed and maintained assault to black people—a structure that includes slavery, mass incarceration, and police brutality as part of its foundation. From his passionate and deliberate breakdown of the concept of race itself to the importance of the Black Lives Matter movement, Coates powerfully sums up the terrible history of the subjugation of black people in the United States. A terrifying new plague is spreading like wildfire across the country, striking cities one by one: Boston, Detroit, Seattle. The doctors call it Draco Incendia Trychophyton. To everyone else it’s Dragonscale, a highly contagious, deadly spore that marks its hosts with beautiful black and gold marks across their bodies—before causing them to burst into flames. Millions are infected; blazes erupt everywhere. There is no antidote. No one is safe. Harper Grayson, a compassionate – pregnant – nurse, treated hundreds of infected patients before her hospital burned to the ground. Now she’s discovered the telltale gold-flecked marks on her skin. At the hospital, she witnessed infected mothers give birth to healthy babies and believes hers will be fine too. . . if she can live long enough to deliver the child. Convinced that his do-gooding wife has made him sick, Harper’s husband Jakob becomes unhinged, and eventually abandons her as their placid New England community collapses in terror. Speculative fiction author and Hugo Award winner (three times over! ), Lois McMaster Bujold, is the author of several series, including the Vorkosigan saga, the Chalion series, and the Sharing Knife series. Her most recent book, Gentleman Jole and the Red Queen is a continuation of the Vorkosigan saga (#16) and was published in February 2016. Spanning 2,000 miles and traversing six states from Missouri to the Pacific Ocean, the Oregon Trail is the route that made America. Today, amazingly, the trail is all but forgotten. Rinker Buck is no stranger to grand adventures. The book tells the story of Buck’s 2,000-mile expedition across the plains with tremendous humor and heart. He was accompanied by three cantankerous mules, his boisterous brother, Nick, and an “incurably filthy” Jack Russell terrier named Olive Oyl. Along the way, Buck dodges thunderstorms in Nebraska, chases his runaway mules across miles of Wyoming plains, scouts more than five hundred miles of nearly vanished trail on foot, crosses the Rockies, makes desperate fifty-mile forced marches for water, and repairs so many broken wheels and axels that he nearly reinvents the art of wagon travel itself. Apart from charting his own geographical and emotional adventure, Buck introduces readers to the evangelists, shysters, natives, trailblazers, and everyday dreamers who were among the first of the pioneers to make the journey west. “The 21-Day Sugar Detox” is a clear-cut, effective, whole-foods-based nutrition action plan that will reset your body and your habits! Tens of thousands of people have already used this groundbreaking guide to shatter the vicious sugar stronghold. Now it’s your turn! Use the easy-to-follow meal plans and more than 90 simple recipes in this book to bust a lifetime of sugar and carb cravings in just three weeks. Three levels of the program make it approachable for anyone, whether you’re starting from scratch or from a gluten-free, grain-free, and/or Paleo/primal lifestyle. M Train is a journey through eighteen “stations.” It begins in the tiny Greenwich Village café where Smith goes every morning for black coffee, ruminates on the world as it is and the world as it was, and writes in her notebook. We then travel, through prose that shifts fluidly between dreams and reality, past and present, across a landscape of creative aspirations and inspirations: from Frida Kahlo’s Casa Azul in Mexico, to a meeting of an Arctic explorer’s society in Berlin; from the ramshackle seaside bungalow in New York’s Far Rockaway that Smith buys just before Hurricane Sandy hits, to the graves of Genet, Plath, Rimbaud, and Mishima. Woven throughout are reflections on the writer’s craft and on artistic creation, alongside signature memories including her life in Michigan with her husband, guitarist Fred Sonic Smith, whose untimely death was an irremediable loss. For it is loss, as well as the consolation we might salvage from it, that lies at the heart of this exquisitely told memoir, one augmented by stunning black-and-white Polaroids taken by Smith herself. M Train is a meditation on endings and on beginnings: a poetic tour de force by one of the most brilliant multi-platform artists at work today. Paul Theroux has spent fifty years crossing the globe, adventuring in the exotic, seeking the rich history and folklore of the far away. Now, for the first time, in his tenth travel book, Theroux explores a piece of America — the Deep South. He finds there a paradoxical place, full of incomparable music, unparalleled cuisine, and yet also some of the nation’s worst schools, housing, and unemployment rates. It’s these parts of the South, so often ignored, that have caught Theroux’s keen traveler’s eye. On road trips spanning four seasons, wending along rural highways, Theroux visits gun shows and small-town churches, laborers in Arkansas, and parts of Mississippi where they still call the farm up the road “the plantation.” He talks to mayors and social workers, writers and reverends, the working poor and farming families — the unsung heroes of the south, the people who, despite it all, never left, and also those who returned home to rebuild a place they could never live without. From the writer whose “great mission has always been to transport us beyond that reading chair, to challenge himself — and thus, to challenge us” (Boston Globe), Deep South is an ode to a region, vivid and haunting, full of life and loss alike. What about you? Tell us, students and faculty members, what are YOU reading this summer? A wise old professor used to tell this story during college orientation, only in his version there were as many bulls as there are weeks in a semester. Library specialist Sydney Gordon, ready for anything. 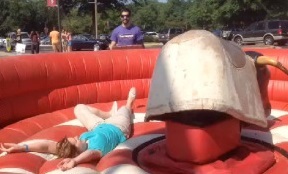 Student Life’s Welcome Back event at Parham Campus this week featured a mechanical bull. Lisa Bishop, also a library specialist, gets set. 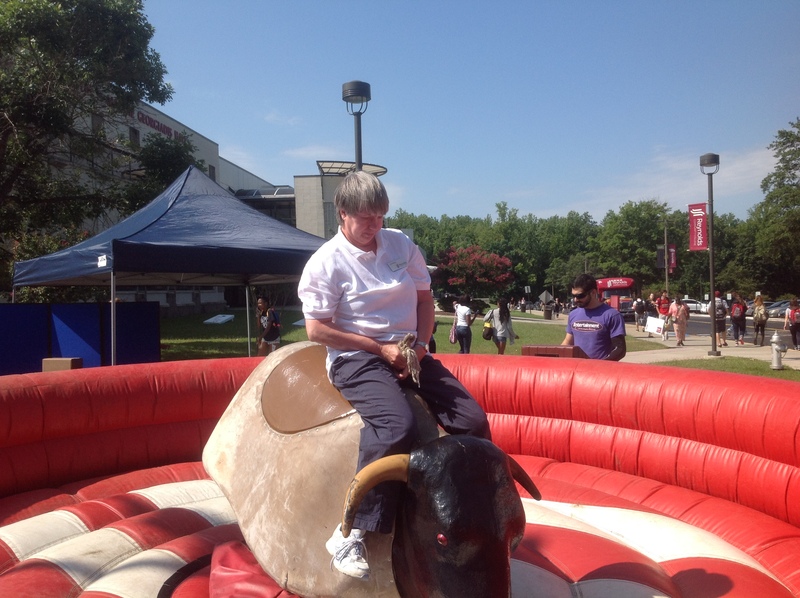 A couple of library staff members tried their cowgirl skills! But look at the bull in these photos – and remember our tale. Don’t let a chance to grab the bull (or the semester) pass you by! Sydney Gordon takes a soft landing.